One of Hollywood’s most prodigious workers, Eve has made contributions to nearly every facet of the entertainment industry. In addition to being a poet, Eve Brandstein has been a major studio and network executive, a producer, a film and theater director, writer/creator, and casting director. She is also an artist, psychotherapist, teacher and workshop facilitator, who has led writing and performance groups. As an accomplished fine artist her work is shown at TAG Gallery at Bergamot Station. She is a publisher of The Hollywood Review an anthology of L.A. poets and also the author of “The Actor – A Practical Guide to a Professional Career” and has published several collections and anthologies of poetry chapbooks. Her next poetry collection will be published and distributed by Zeitgeist Press. She is also the producer of the celebrated reading series – Poetry In Motion, launched in 1988. Poetry in Motion is presently a bi-coastal monthly series at Beyond Baroque in Venice and various venues in New York City. Eve Brandstein with Global Road and Act iii will executive produce Rain Pryor’s Fried Chicken & Latkes, for a telelviaion series that Brandstein. In 2018 she will be directing a multi-media theatrical production of Anne Frank’s Diary for The Museum Of Tolerance Los Angeles which will also be performed in Jerusalem, Israel.Eve is the director of the recent long running hit shows – Not That Jewish with Monica Piper and Rain Pryor’s Fried Chicken & Latkes. She has directed over 75 theatrical productions on both coasts and Israel. Most recent shows – NY Off-Broadway 2 year hit, Shut Up Sit Down & Eat, NY and LA premieres of Revisiting Wildfire, the NY premiere of Voices Of Swords, Ronnie Spector’s Beyond The Beehive, Waiting For Jack – A Beat Poetry Reunion, Claiming Allen Ginsberg, and Suzanne Wang’s Cracked Open. 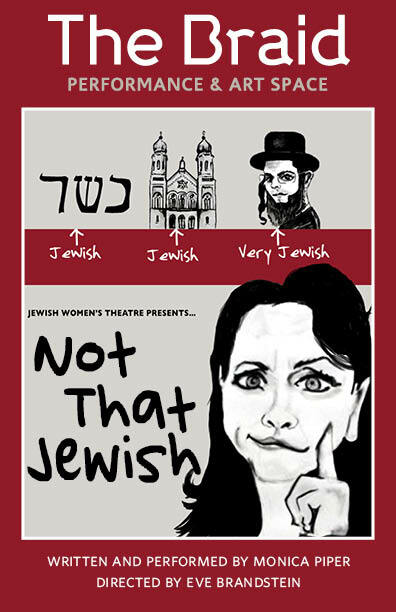 Eve has also directed many Jewish Women’s Theater shows Stories From the Fringe, Saffron and Rosewater, Hold Me, Heal Me, He Said, She Said, Past & Present: Russian Jewish American Stories. Beyond Jacob’s Ladder, More Courage – Muslim & Jewish Stories and Crossing Our Red Sea. Next up is Barra Grant’s Miss American’s Ugly Daughter, about her relationship with her mother, Bess Myerson.